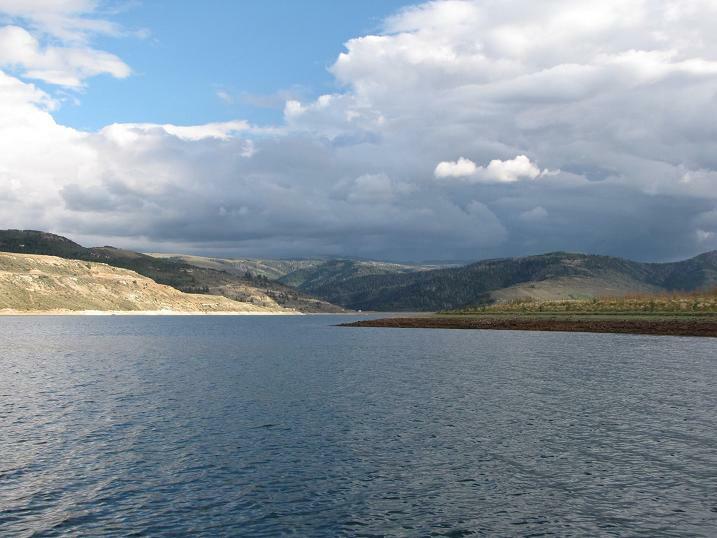 Storm clouds were gathering as I reversed the boat trailer down the Soldier Creek boat ramp at Utah’s premier trout fishery, Strawberry Reservoir in early September. Friend Ray soon had his boat unhitched and we were heading out to his favourite bay a short distance from the ramp, where he was confident we would catch. 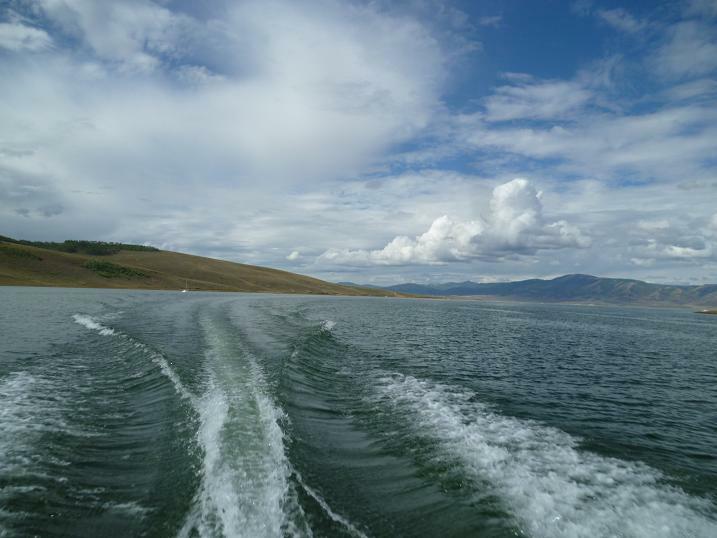 With over twenty days at over 100 degrees this summer, the upper layers of this 17,000 acre water were were still considered too warm to fish, although being at 7,600 feet it stays cold in it’s 150 foot depths, where land locked red kokanee salmon shoal. Depths between 25 and 30 feet had been giving good results and Ray’s bay was showing these figures on the depth finder, as we made our first casts, simple running leger rigs, baited with Powerbait on treble hooks dropping into the clear water yards from the boat. Ray was fishing his standard two foot tail, while I opted for longer at five feet, the buoyant Powerbait floating above the weed, well away from the greedy claws of the local crawdad population. Minutes after our baits hit the water, my rod rattled from a positive bite, a strike and I was into my first fish. 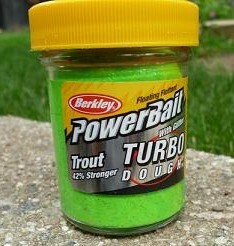 Immediately I was in trouble with the unfamiliar borrowed tackle, as the rod bent into a good fish. 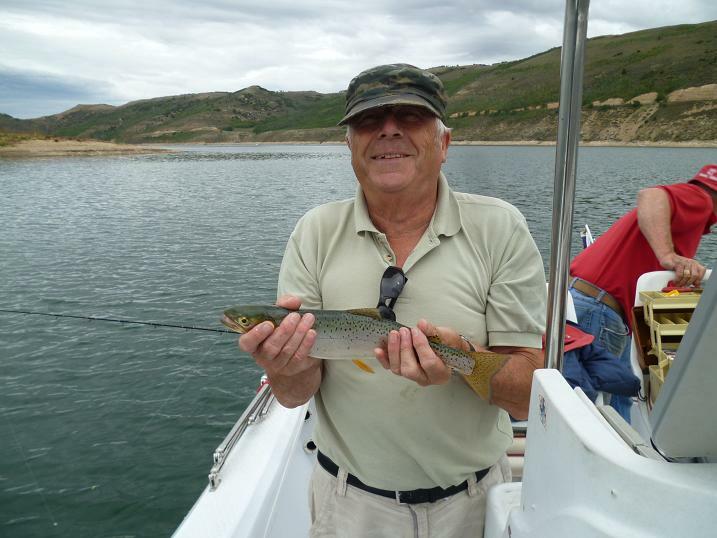 With the reel having no back wind and the drag set to maximum, I was unable to counter the runs and dives of this battling cutthroat trout, just managing to release the drag in time, as it approached the boat and made another deep dive. 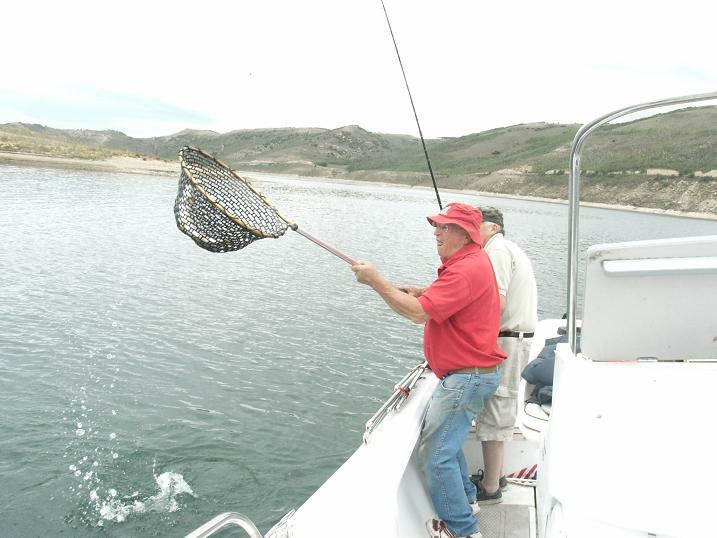 Ray was accurate with the net, scooping the 17 inch trout up, when it made another pass. Strawberry fishery rules state that all cutthroat of breeding size between 15 and 22 inches, be returned immediately to the water, just one of the trebles holding in it’s jaw, being snipped off with pliers to avoid unnecessary damage. 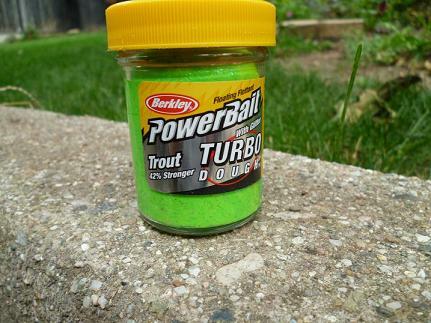 I cast again and before I could put the rod down, the line began moving across the surface. 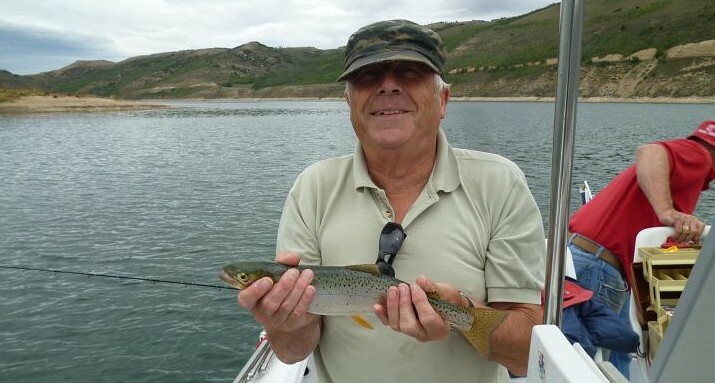 Another fish had taken the bait on the drop and a deep bend in the rod signaled a fast running trout, which turned towards the boat, gaining slack line and coming off the now double hook. 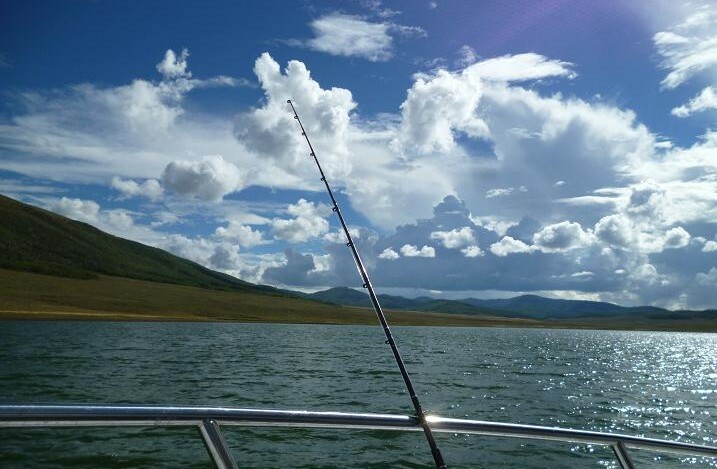 Ray had his eye on the gathering clouds and a bolt of lightning, followed by a clap of thunder eased the decision to leave this obvious fish holding spot and head north towards brighter skies ten miles away down the reservoir, through the Narrows and out into the Basin. 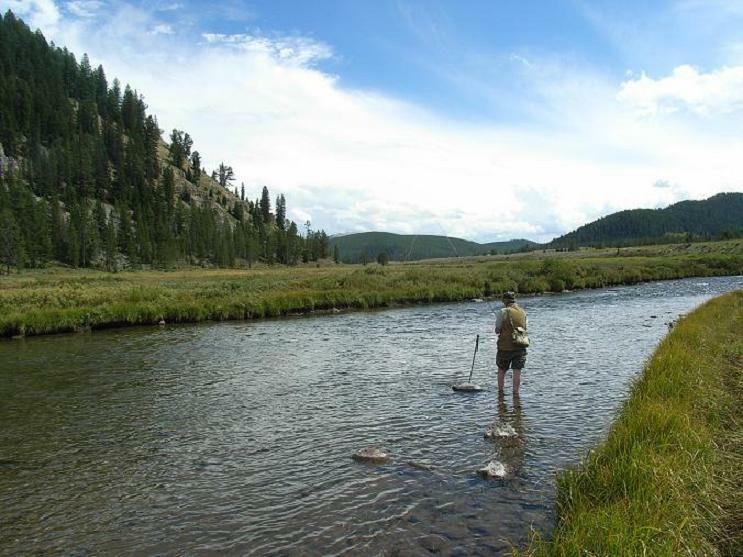 As we neared the shore, we had to manoeuvre between a group of float fly fishermen, who had found a shoal of small rainbows feeding near the surface, the fish rising freely around the us. 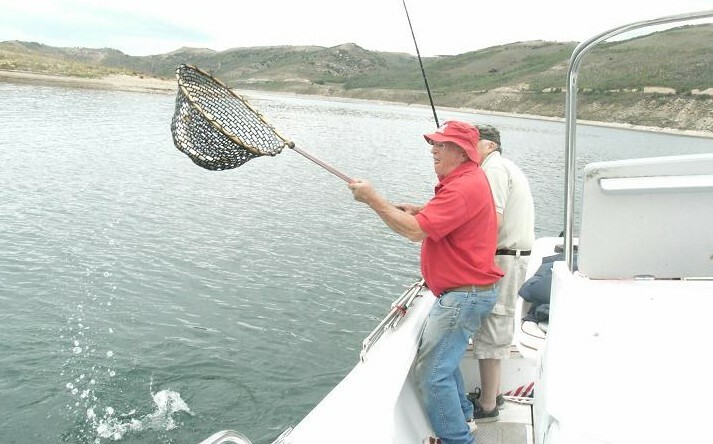 I’d brought my fly rod onto the boat and this was my chance to demonstrate to bait fisherman Ray, the excitement of taking trout on the floating line from a boat. At this point my enthusiasm collapsed, when I realized that the rod had been accidentally trodden on and crushed at the ferrule. With fish near the surface, Ray killed the main engine and ran his small trolling motor at tick-over, while I cast a small Mepps spoon out from the side of the boat, paying out line to allow the spoon to sink and swing back behind the boat in an arc. Several casts later, the rod bucked as a trout hit the lure and I found myself playing another hard fighting cuttroat, once again Ray was spot on with the net, scooping the fish from the surface. 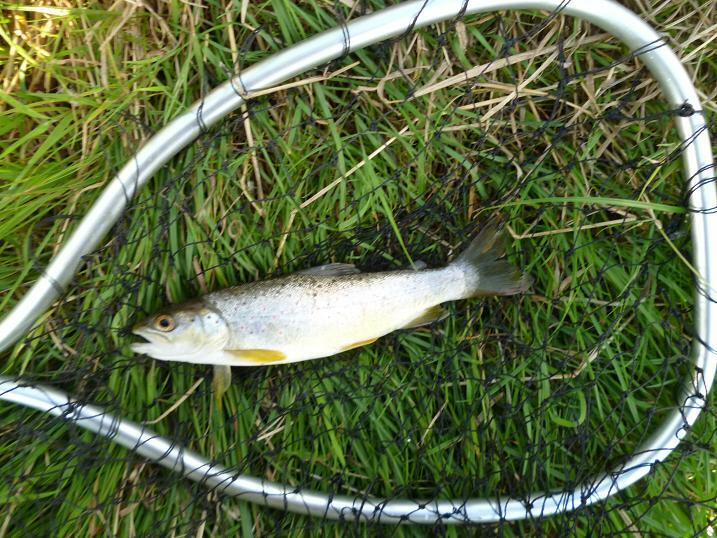 This was another cutthroat that needed to be returned, but not before a quick photo for the album. The spoon was firmly in the scissors of the jaw, the cutthroat biting down hard on two of the three hooks and the pliers were needed again before release. 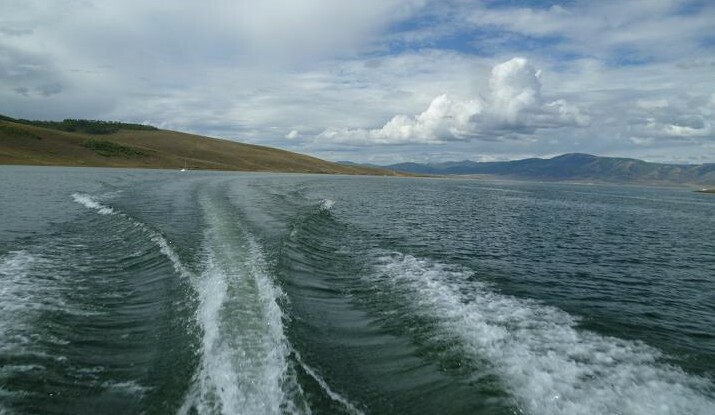 Ray decided to head back towards Soldier Creek, but not before a stop at the Meadows and few drifts along the gently sloping shoreline with Powerbaited hooks. We had already passed through a heavy rain shower and a strong wind was beginning to sweep more clouds towards us. I was still holding the camera for this shot of a dramatic sky, when the rod rattled and I struck into what I thought was the biggest fish of the day, as it ran rings round the boat, diving beneath it at will, until it gave up thrashing on the surface. This was in fact the smallest and last fish of the day, a plump 14 inch rainbow, which resided in the holding tank, until released at the end of our trip. A few more missed bites later, the clouds closed in, the temperature dropped and torrential rain swept in across the Uinta National Forest lashing the surface. Under the canopy, we huddled round the cockpit in an effort to avoid a soaking, the boat making steady headway against the storm, emerging from the Narrows to Soldier Creek and sunshine. 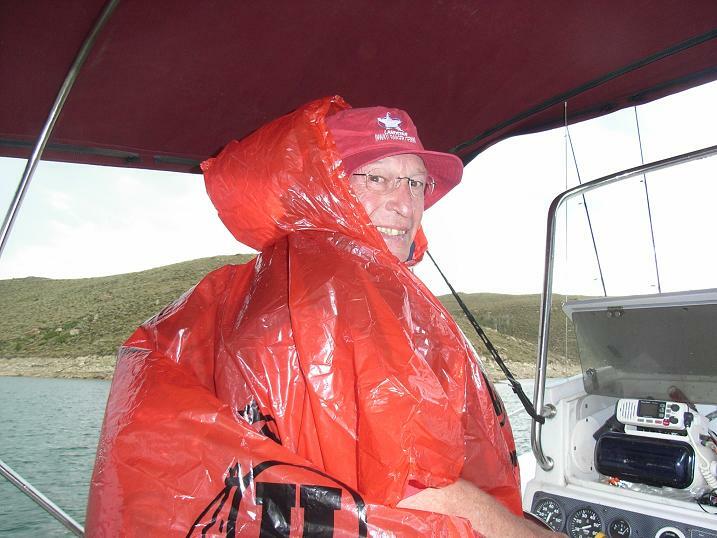 We barely had time to get the boat back on the trailer, before another storm hit for a wet 80 mile drive back to Ray’s home in Bountiful north of Salt Lake City. 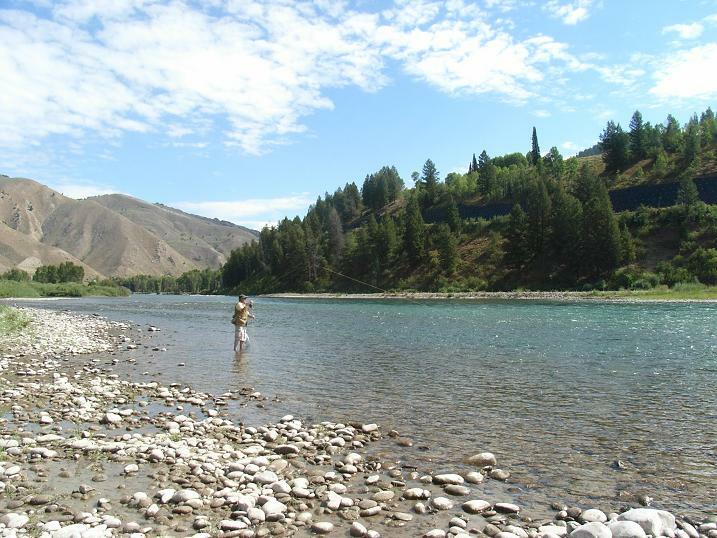 A lunch stop on the Snake River, downstream from Jackson, Wyoming, gave me the opportunity to fish the upper, freestone reaches of this river, before it slows to begin it’s 1,000 mile journey across Idaho to join the Columbia River. 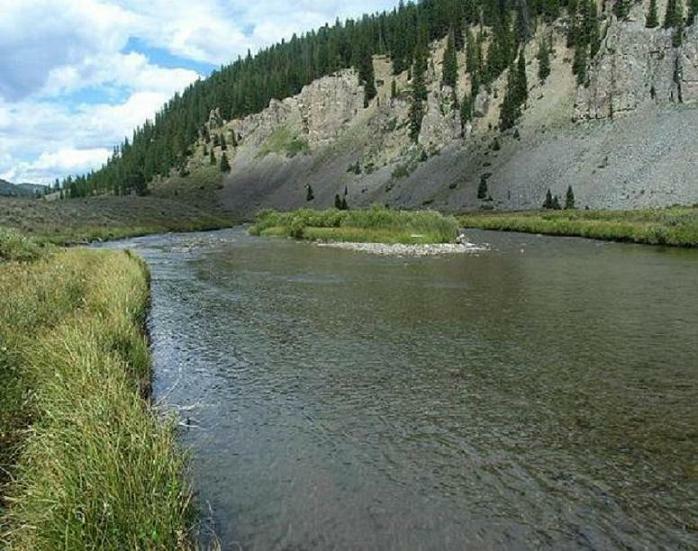 I’d already fished the head waters of this mighty river within the bounds of Yellowstone Park, managing to lose, or be broken, while fishing a deep pool with hoppers, by brown and cutthroat trout, frustrating my attempts to get them in my net, before a thunderstorm stopped play and soaked my wife and I to the skin. Access is difficult on the Snake, as it has carved it’self through a deep valley, but a boat launching site provided shady parking and shallow water to wade. At this point the river speeds over stones in a series of riffles and rapids and looks unfishable, but trout were rising in front of me within easy casting distance and I waded in to offer my hopper and gold head size 16 pheasant tail nymph. I began casting upstream to the rising fish and watched a cutthroat take a sideswipe at the big hopper, hooking, but losing the trout, when it dropped below me. In hindsight I should have tried an ant, or a klinkhammer, but the foam hopper stayed afloat in the roughest water and I could see it easily. A few casts later, another rise resulted in a fish on and a rod bending fight, as the fish took full advantage of the flow, belying it’s size when finally in the net. 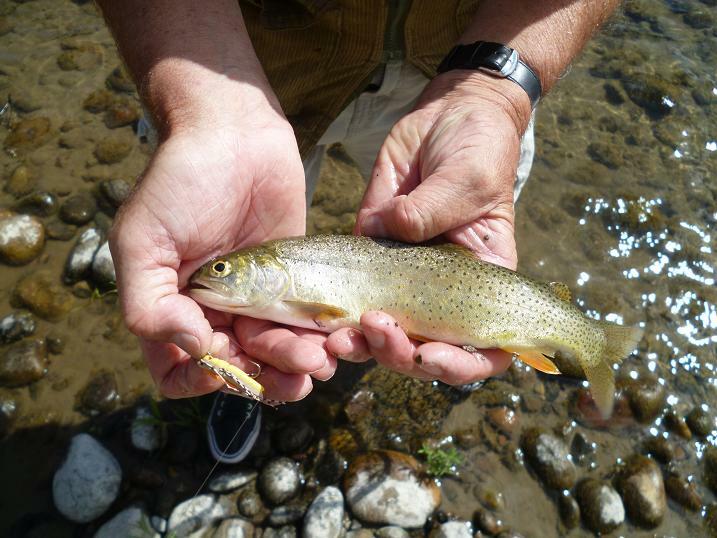 Despite it’s size, the foam hopper could not be resisted by this small cutthroat and many of it’s friends, although setting the hook proved a random event. Having succeeded in putting all the trout down in front of me, I changed tactics and began drifting the hopper downstream, rising a few fish, then hitting into a hard fighting brown trout. With a series of boats being launched, where I was fishing, it was time to enjoy lunch in the shade of a tree and ponder my next line of attack. The hopper had proved it’s worth against several smaller trout, but I wanted a bigger fish to round off my visit and dug out a Blue Flash Damsel from my box. 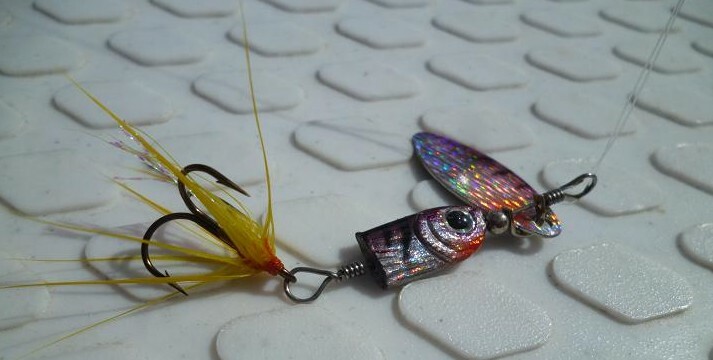 This is a deadly lure on English lakes and with it’s bead head, it stood a chance of getting down to the larger fish further out. On my second cast out and across, mending the line to keep the lure out in the stream, I drifted the Blue Flash Damsel downstream, while paying out line, the rod bending over, when a big fish hit the lure. All the slack line was taken in it’s first run and following a few head shaking sessions, the process of bringing it back began, countering each run with steady pressure, until the fish was only a few feet away, rolling in the current, a cutthroat of around 16 inches. My wife was poised with the camera and my net outstretched, as I reeled in the last few yards on this beaten trout, when pop, the hook lost it’s hold. We looked at each other stunned. If there was a fish more ready for the net, then I’ve not seen it. 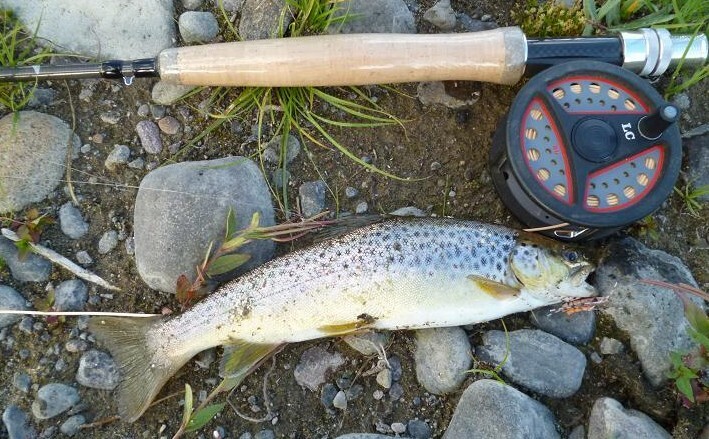 With many more miles to travel that day returning to friends in Salt Lake City, this was my last chance to fish these big trout filled rivers, and I reluctantly put away my rod, hoping that a lottery win was waiting on my return to the UK. 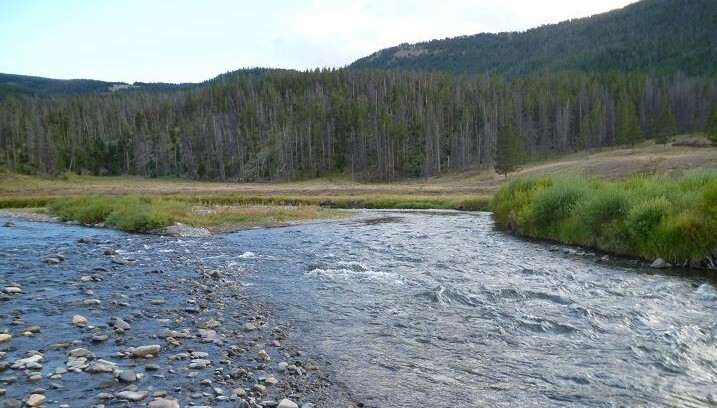 At the confluence of the Gibbon and Firehole Rivers in Madison, the Madison River is formed and meanders parallel to the road all the way to West Yellowstone on it’s way to Hebgen Lake. I fished the upper few miles of this already powerful river, where it reminded me of the Hampshire Test, a steady flow and luxurious weed growth, allowing a more relaxed style of fly fishing among spectacular scenery. I’d intended fishing the Gibbon, as advised by the flyshop owner in West Yellowstone, but a bison on the road had caused a traffic jam, so I turned back to the nearest parking spot and got my rod out. I still had the hopper, nymph combo from the Gallatin attached and walked down to a likely looking run, where a large rock was forcing the river out from the bank. First cast, as I watched the hopper drift along the glide, it slid sideways and disappeared. I lifted and was into my first Madison fish, which promptly zoomed off downstream. The angler downstream complained that he’d spent twenty minutes there before me without a touch. 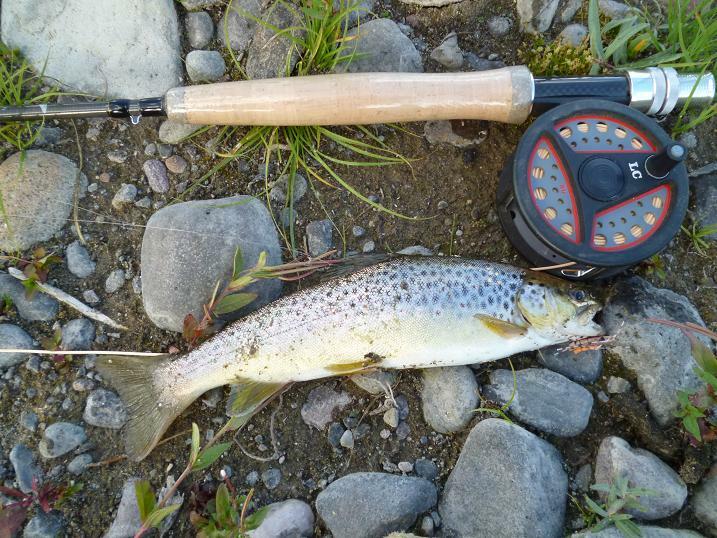 This put more pressure on not to lose this fish, which was making the most of the strong current. This was a decent sized rainbow, that fought all the way to the net and was aware that the size 16 gold head pheasant tail could slip out at the slightest turn, giving a sigh of relief, when it was finally in the net. This rainbow was beautifully marked, with a massive tail, it’s solid round body testament to the healthy diet available to these trout. The nymph was safely in the scissors of it’s jaw, a speedy unhook and it was back in the river, darting away. 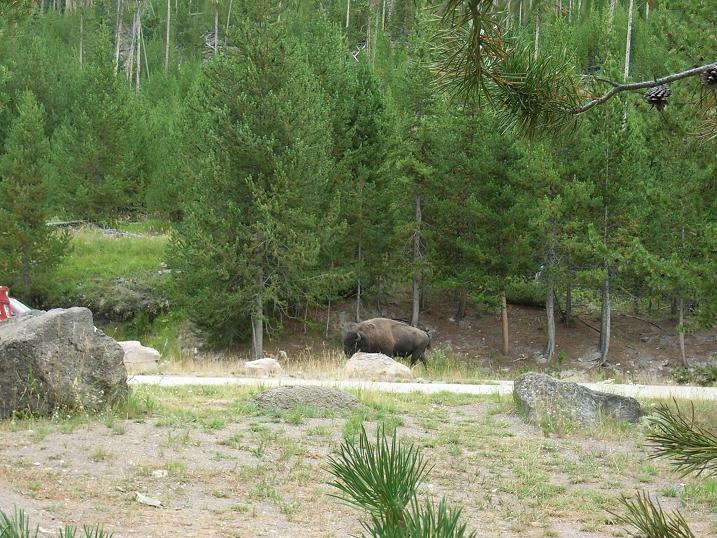 At this moment calls from the roadside made me look up to see the errant bison strolling into our parking area, quiet oblivious of the curiosity and panic that it had invoked among it’s onlookers. With the bison continuing on it’s way, to browse the meadow downstream, I got back to fishing, having been joined by another local flyfisherman, who like me, enjoyed fishing talk. Like his friend, he had not caught all morning and had come up to see what the Englishman was doing and to advise me of the many waters I could fish, if I had time. I was casting across and drifting the hopper downstream, while paying out line, covering more water each cast. 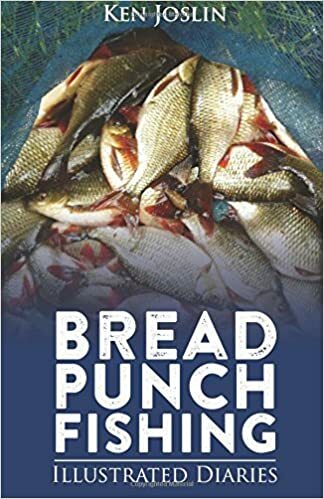 He’d just complimented me on my line mending, when the hopper was engulfed in a swirl, the line tightened and I was into my second fish, only minutes after the first. This trout exploded on the surface, before boring deep, stripping line from my reel down to the backing, as it fought across the river. These trout are all muscle, due to the conditions that they survive in and it was a while before I saw the bronze sides of a good brown, when it topped mid stream. 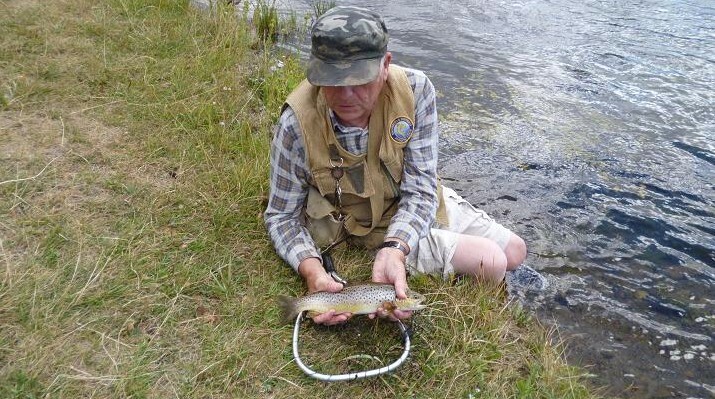 My new friend volunteered to net my fish and as I watched him struggle down the bank on his reconditioned knees, I realized that at age 77, he might not be the ideal candidate to do so. Once in the river, however, after a few heart stopping misses, it was mission accomplished and he got his net under the trout. Another good fish, this one measuring in at 14 inches, had taken the hopper, turned and hooked it’self, then given a fight harder than any brown trout twice it’s weight, that I’d had on my home chalkstream, making several last minute dives for freedom, once it neared the net. With the road now clear and the natives impressed, it was time to get back on the tourist trail again and head in the direction of Mammoth Springs and Tower Falls, followed by Yellowstone Canyon, a true sightseeing fest, before finding myself with fishing time to spare on the return journey, when my wife requested a stop to view an osprey nest on the other side of the Madison. We watched as an osprey dived into the river and arose with a large trout in it’s claws. The large flapping fish proved too strong and it fell back with a splash. The search continued, another victim was selected and a one pound fish was being lifted from the river, the osprey turning the trout head first to streamline it’s flight back to the nest, while it’s partner flew cartwheels of appreciation around it shrieking. The Madison was dotted with rising fish and I watched a large grass hopper jump as I walked, the strong wind carrying the flying insect far out into the river, it’s struggles to escape the surface ending with a plop, when the jaws of a brown clamped shut, baring it down to the depths. Coping with the swirling upstream wind was a problem, an approaching thunderstorm creating it’s own weather system in the mountains and staying in contact with the fly was difficult. 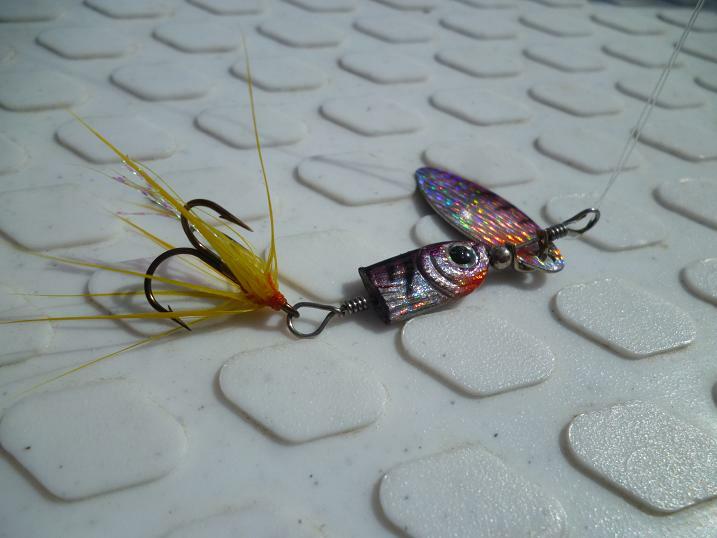 The hopper was drifting down, I was retrieving slack line from my cast, when the hopper dragged under as the nymph was seized. I lifted the rod more in hope than expectation. At the extreme of my lift, I felt the weight of a fish, a pull of line through the rings and the rod doubled over with the power of a running trout. 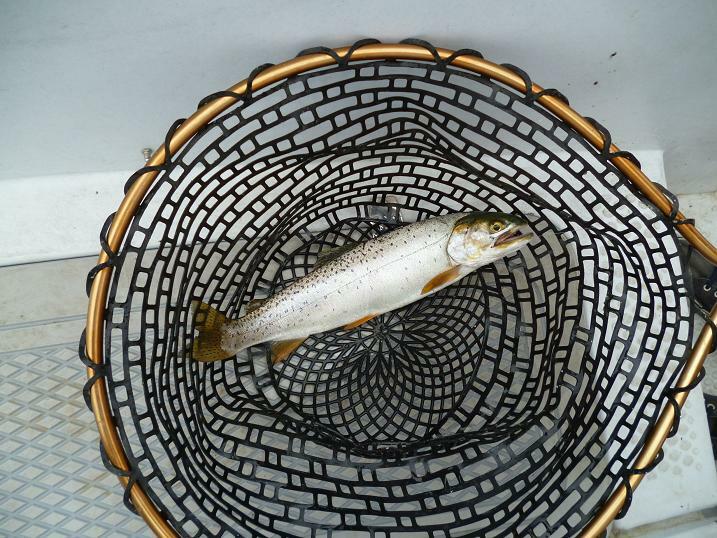 My goodness, how these trout fight, another breathtaking battle and I slipped the net under a quality brown. 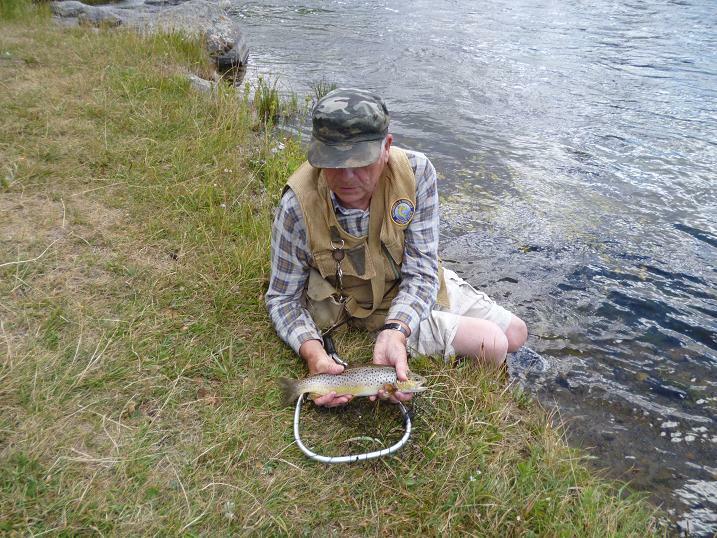 Holding the fish for a photo was a fight in itself and the brown trout was soon swimming free. Two smaller brown trout followed among missed takes and lost fish, before the hopper was hit with a crash and a rainbow was cartwheeling across the surface, diving deep and running upstream, singing the reel in surges of acceleration. Giving line when needed and stripping back, when the rainbow began to lose ground, I was in control and waiting to bring it over to the edge of the shallows, when it gave one last lightning surge, pulling the rod down flat with a ping as the hopper’s 8lb link snapped like cotton, a twist of line, where the knot had been, being all that remained. The thunder had been getting closer with blobs of rain splatting down into the grass it was time to get back in the car and head back to West Yellowstone. 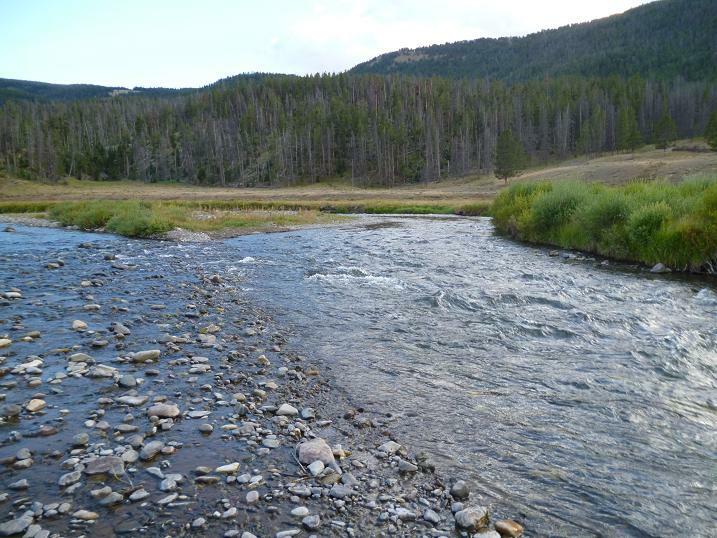 25 miles north of West Yellowstone, the Gallatin River turns to accompany Highway 191, growing in width and strength as it rushes north. It’s character changes in places, where beaver dams divert the river into slow meanders, but in the main it speeds on it’s way over stones and riffles and is easily waded from bank to bank. I kept within the boundaries of the Park, plenty of pull offs allowing easy access to the river, where wading was an easy option and I worked my way up river casting to likely fish holding areas. Fish were rising to small black flies in the tail of a pool on the first section I tried and set up with a floating ant and size 16 pheasant tail nymph as a dropper. About three feet deep with a strong flow, short casts were needed to stay in contact with the fly, the first fish taking the nymph aggressively, the rod bending into the fish on the take. The trout was invisible despite the gin clear water, staying deep, then running downstream, where a flash of pink told me it was a rainbow. 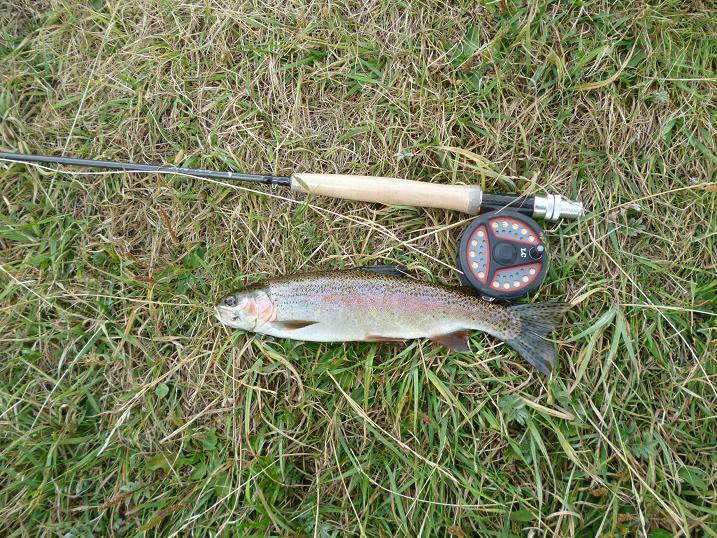 Not a large trout, about 12 inches, I was soon guiding it tumbling on the shallows to my net, only for it to bounce against the rim and come off. 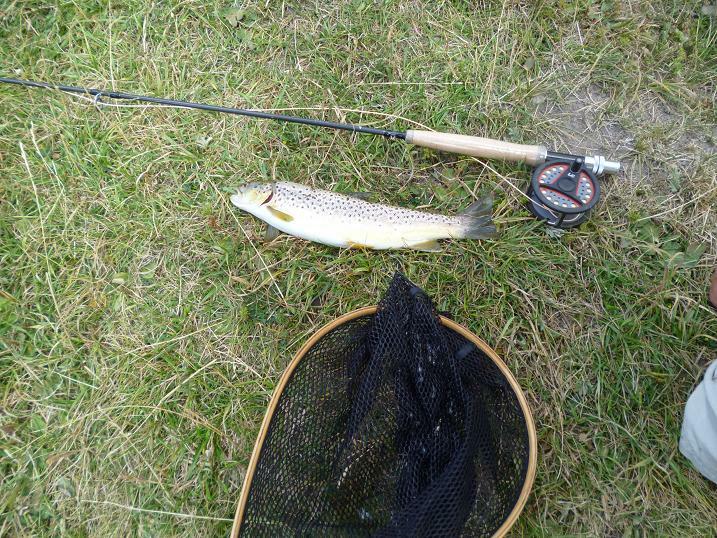 Not a good start, but splashes indicated trout were still rising and after a few misses was into my next fish, this time on the ant, the smaller brown putting up a brief fight before I lifted it into the net. More takes followed as I worked up the pool, some to the nymph and some to the ant, the trout weren’t fussy, they were small, but scrapped hard in the rapid waters, mostly spinning off the hook before I could lift them out. I covered about three hundred yards in an hour, searching out the deeper pools and runs hoping for better fish, but none came and returned to the car to continue the tourist trail down through Gallatin Canyon and a drive up to the Big Sky resort on Lone Mountain, where a beaver was building a dam at 10,000 feet. Later in the day, returning along 191, I pulled the car over just inside the park and made my way up river to fish the inside of a big bend, where deep water was pushing hard against the far bank, large rocks creating swirling eddies, that looked like they held fish, while the inside held slack water. This time there were no rising fish and the ant, nymph combo resulted in one missed pull to the nymph, when worked upstream, the ant soon drowned in the rough water. With grass hoppers scattering at every footfall, it was time to reach into the fly box for one of the monster foam hoppers bought at the fly shop, at least it would act as an indicator to the nymph. I continued to work my way upstream, but had no offers, so turned and drifted the hopper downstream, feeding line as I went. A swirl in the choppy water caught me by surprise, as a trout rose to the hopper and I failed to make contact. The next one shook my rod with a bang. Another miss. I raised the rod and put a bow in the line. This was the answer, as I drifted the part submerged hopper across the slower inside bend, the line sprang taught and I was into a rod bender, that used the full force of the river to attempt an escape. When I finally brought the brown trout to the net, I thought someone had switched fish, as it was much smaller than it had first seemed. This proved the winning method and I worked my way back downstream, casting across, drifting down and swinging across the flow into slower water, some fish missing the hopper, me missing reel singing takes, the size 14 barbless hook releasing more fish than it held, but I was fishing for sport, enjoying every moment of anticipation. 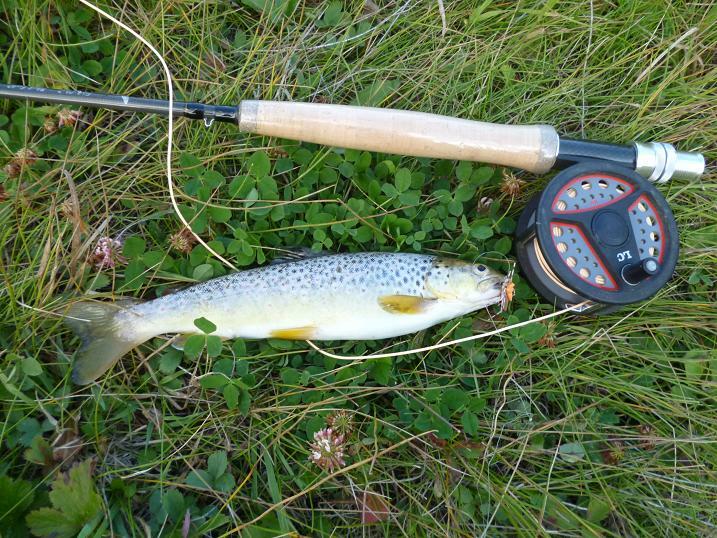 The trout were all browns around 10 to 12 inches, I’d hoped for a few cutthroat and rainbows, but I was happy to be able to adapt to a new way of fishing and get results. 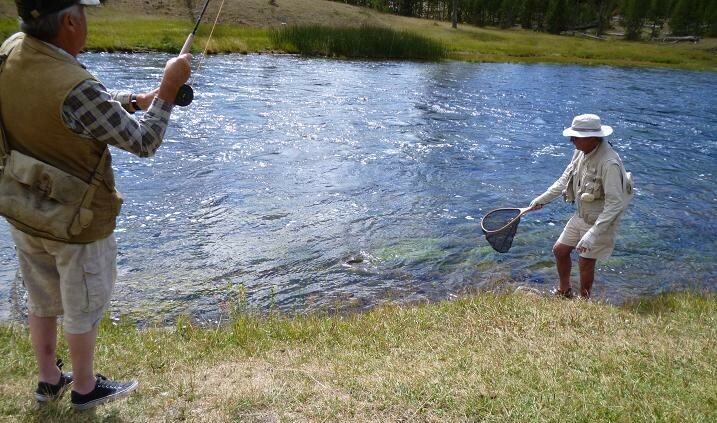 Yellowstone National Park trout fishing at Hopper Time. 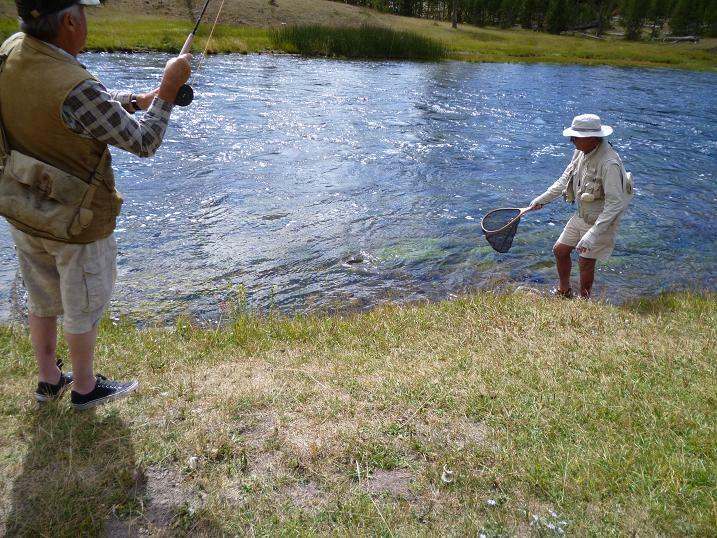 Long on my wish list, fishing for trout in Yellowstone National Park, became a reality, when on a whistle stop tour of the tourist hot spots and springs, through Montana and Wyoming last week. 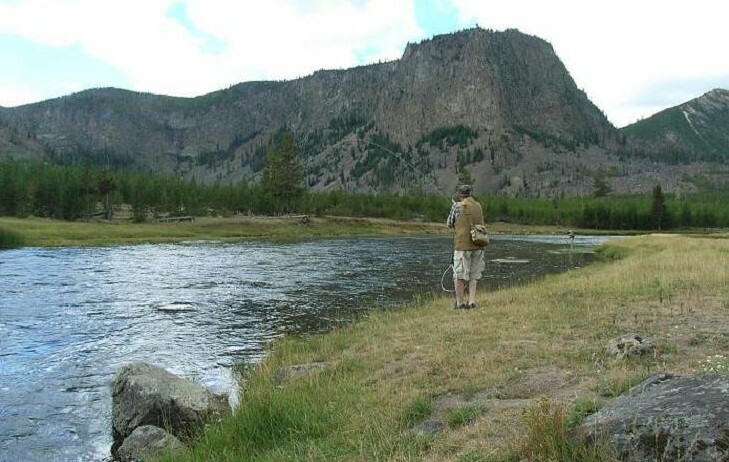 Based in the old pioneer town of West Yellowstone, a place that has more fly shops, than places to eat, I was able to sample a mix of mountain free stone streams like the upper Gallatin River, the Madison, through to the massive Snake River, tumbling between the green hills of Wyoming towards the wide plains of Idaho. August is Hopper Time on these crystal clear waters and a walk through the riverside vegetation creates showers of escaping grass hoppers, some three inches long, that inevitably are borne by the strong winds onto the river surfaces. 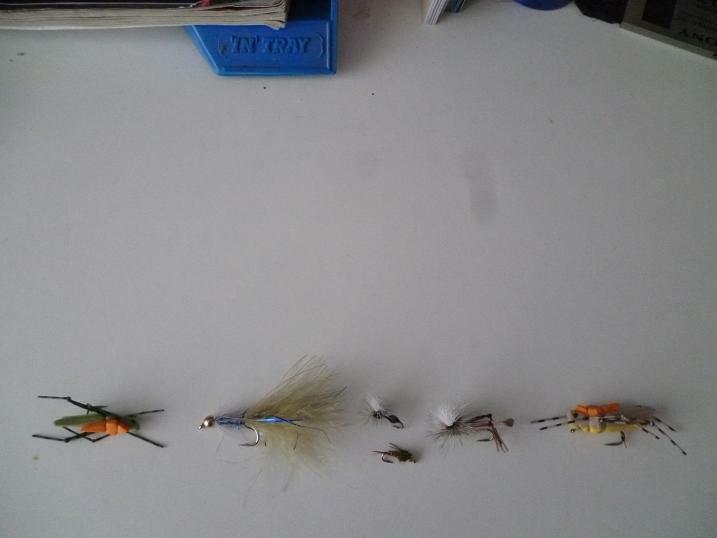 To an English fly fisherman like myself, the foam grass hopper imitations, with their striped rubber legs, were a curiosity, bought to be shown with a smile to my fly fishing friends back home, but coupled as a Hopper and Gold Head Pheasant Tail combo, they proved deadly on these powerful river trout. 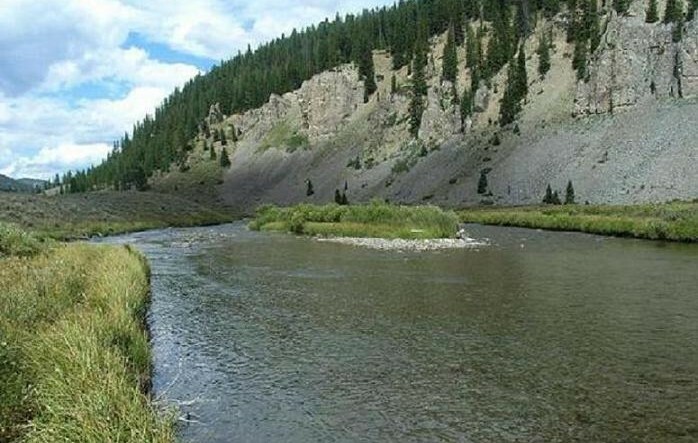 As on any river, being able to read the water, goes a long way to aiding success on these wild torrents, a good strong flow indicating deeper water below seemingly unfishable rapids. Brown, rainbow and cutthroat trout are invisible, even when hooked, as they battle the current, the bright sunlight reflecting flashes of colour from the stone strewn riverbeds, while cloaking the identities of these battling torpedoes, until they are finally in the landing net. Without the restrictions that apply to my local Hampshire chalk stream, which is single fly, or nymph fished upstream only, it was interesting to sit and watch the “locals” fly fishing, many styles and ranges of tackle being used to to one end, catching trout. 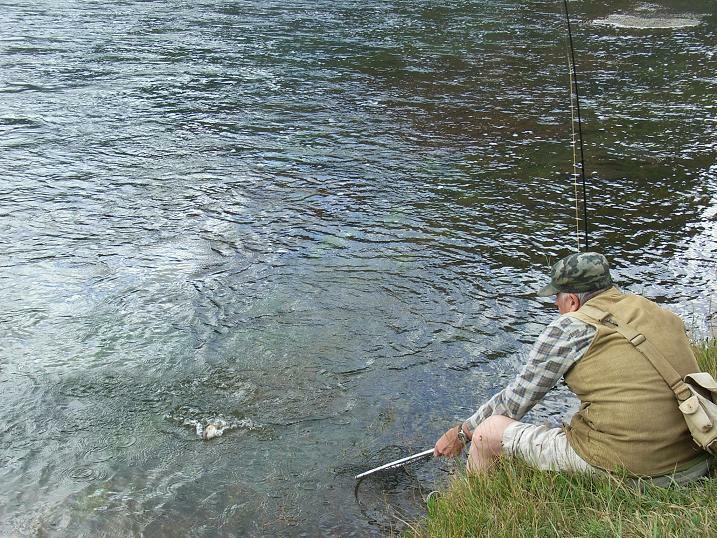 Wading and drifting a big buoyant fly downstream, with the option of a weighted dropper fly was common, as was the use of streamer flies fished below the surface. Spinning rods with bubble floats were also in use by a family strung out across the upper Snake River, who were having a great time, the kids in competition with mom and dad, catching several small browns and rainbows on grass hoppers and wooly buggers, drifted down among the rocks. 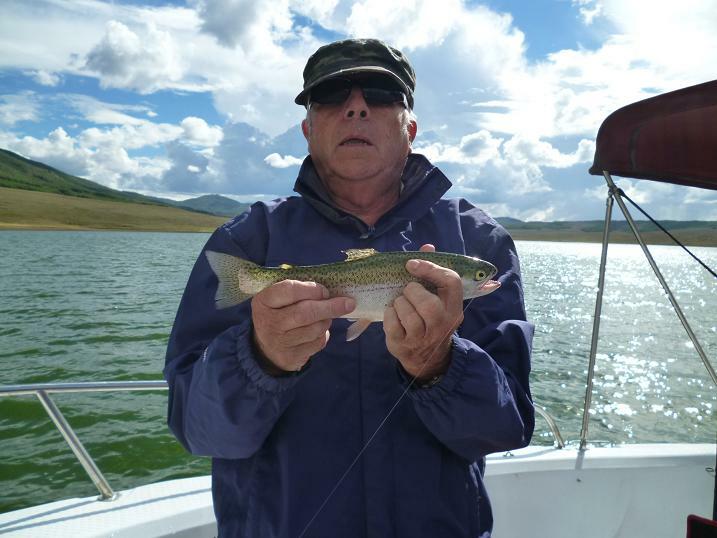 During a three day stay, I caught trout on all of the above, fished singly, or as combos, up and downstream, losing more fish than I netted due to the barbless hook rule, while complying with the Park’s catch and release policy. 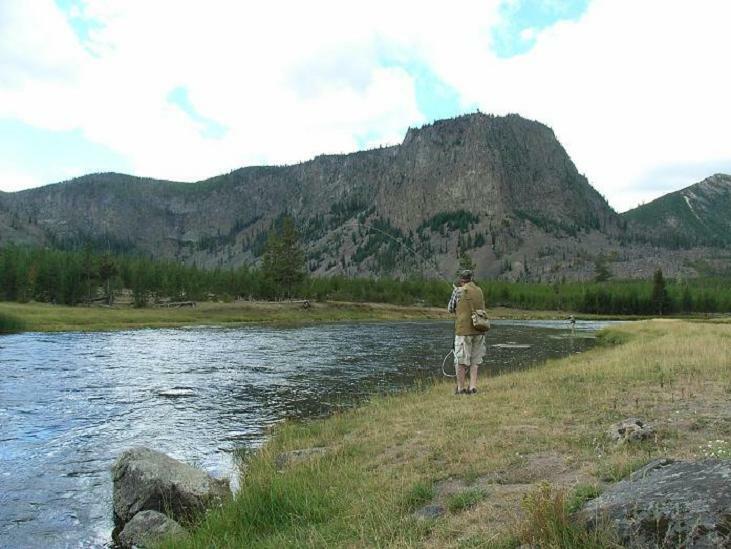 In the Lamar River range on the north eastern side of Yellowstone, anglers are asked to kill all rainbow and brook trout caught, to encourage the native cutthroat trout to re-establish, while non native lake trout have also become a problem, predating cutthroats over their spawning grounds, so once again must be killed in Yellowstone Lake, whatever their size. 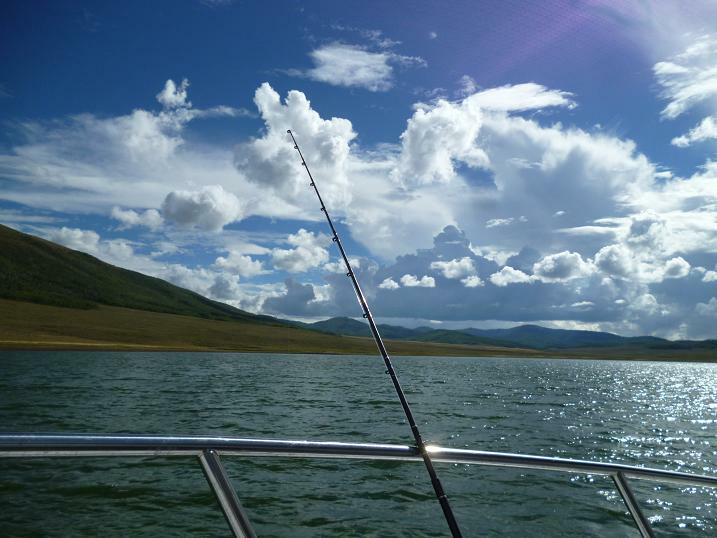 A three day non resident fishing license cost $18 USD, allowing access to over a thousand miles of the best fishing you will find anywhere, in some of the most stunning landscapes ever. 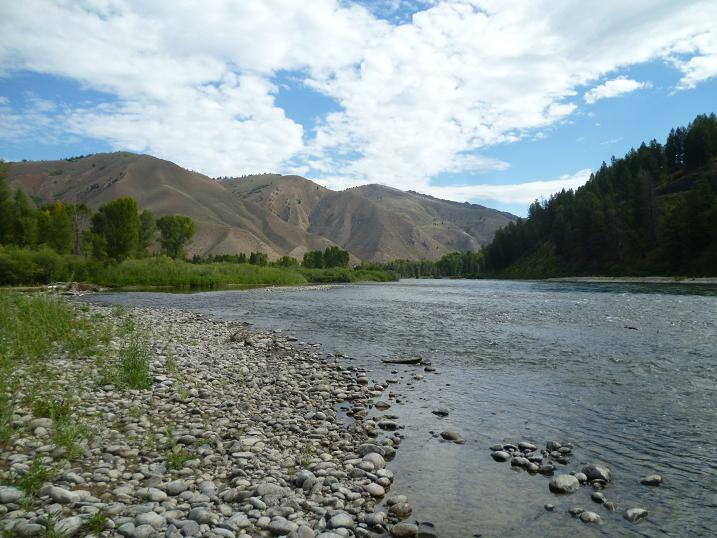 If you can get to a river, you can fish and if prepared to trek a few miles upstream away from other anglers, then it could turn into a red letter day. I was only able to fish within half a mile of the road, due to a wife, who has a good respect for bears, but still caught plenty of trout. The bears are there, a mother black bear and two cubs passed within a 100 yards, crossing the path we were on a few minutes before. 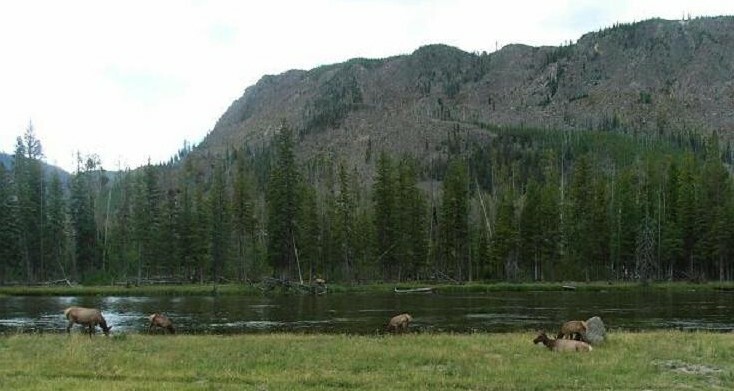 Yellowstone Park is managed for the benefit of the animals and birds, a healthy fish population is looked on as a food provider for bears and ospreys, anglers being the people willing to pay for it. 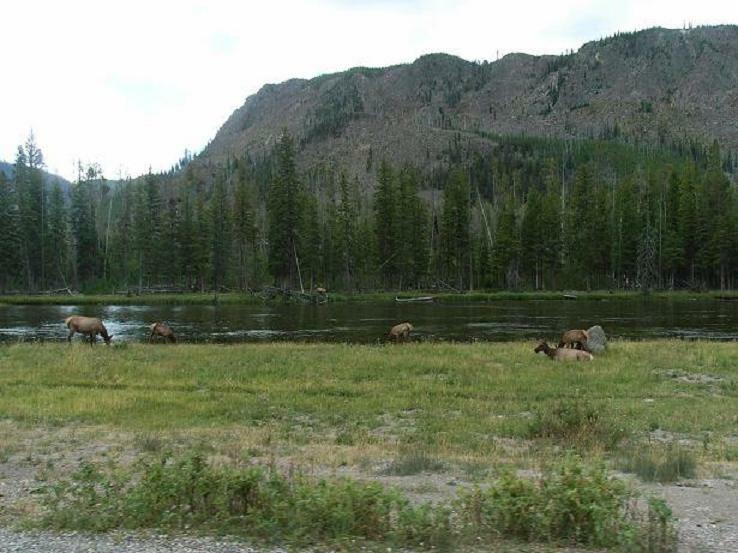 Herds of bison block the roads and osprey take trout back to their riverside nests, reminding urban visitors, that life carries on regardless in the Park, when we return to our air conditioned homes. 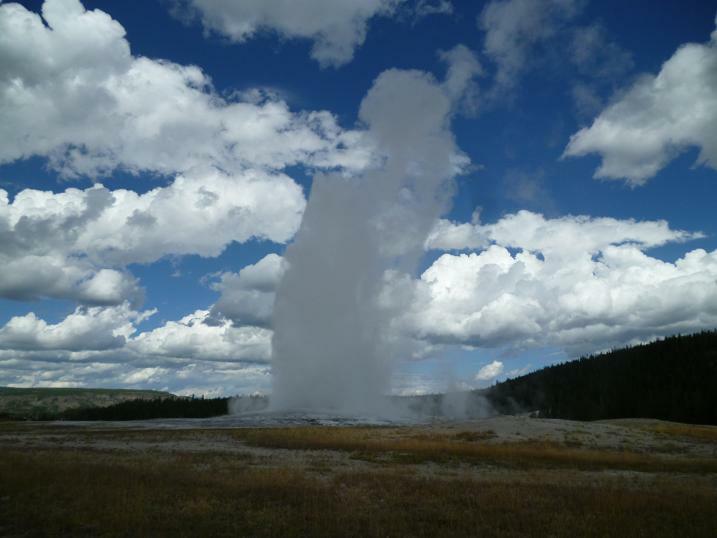 Hot springs and geysers are everywhere throughout Yellowstone, Old Faithful erupting every 92 minutes, while waterfalls and canyons remind the visitor, that they are in a special place.